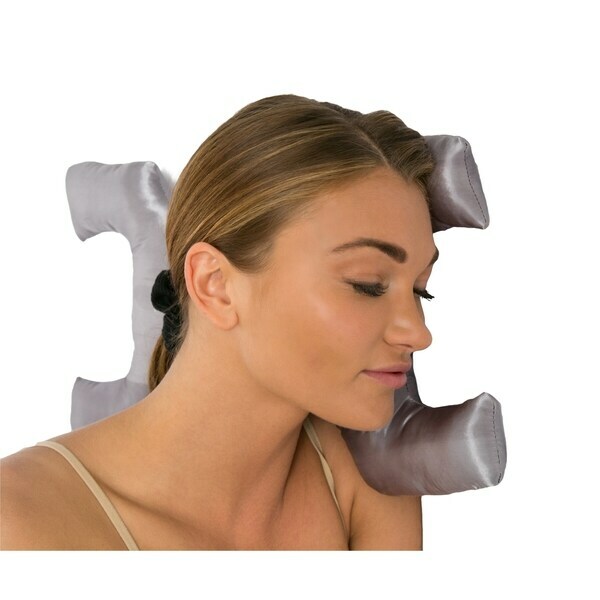 Fabulous feel, well shaped for neck support. Has significantly reduced neck popping and cracking from an accident 10 years ago. Wake up looking and feeling healthier and younger. Designed to prevent sleep wrinkles, this anti-aging Key Pillow has a custom design that will prevent permanent sleep lines, chest wrinkles and eye puffiness while you sleep. Sleeping on cotton can pull and snag your hair. This pillow is ergonomically designed to lift and cradle your face so you do not develop permanent sleep lines and wrinkles on your face, neck and chest while you sleep, keeping your face and eye tissue away from the sleeping surface. The Beauty Pillow design and the satin fabric protect your face from wrinkles while you sleep. The unique Beauty Pillow design and the satin fabric protects your face from wrinkles while you sleep. Why satin vs. silk. The reason we selected a satin case rather than silk is because satin does not absorb expensive skin care products while you sleep, where as silk does. Care instructions: Machines wash on delicate on cold. I wish I had this years ago! I’m almost 30 and try to live by the motto: prevention is cure. I have noticed that my neck wrinkles aren’t as pronounced when I wake up over this last week of use. Also with having a preference to lay on my side this pillow hasn’t made me lose any sleep either. It’s surprisingly comfortable and snug. In addition to preventing wrinkles it also can prevent breakouts. The reason why I’m deducting one star is because it doesn’t have a cover that can be taken off and washed. Otherwise I’m very satisfied with this purchase. I may buy one for my mom too. Rather hard to get used to sleeping on, but I think it'sdefimitely worth it. Love this pillow. It is small but works well if you like less bulky letters. Great if you have eyelash extensions!